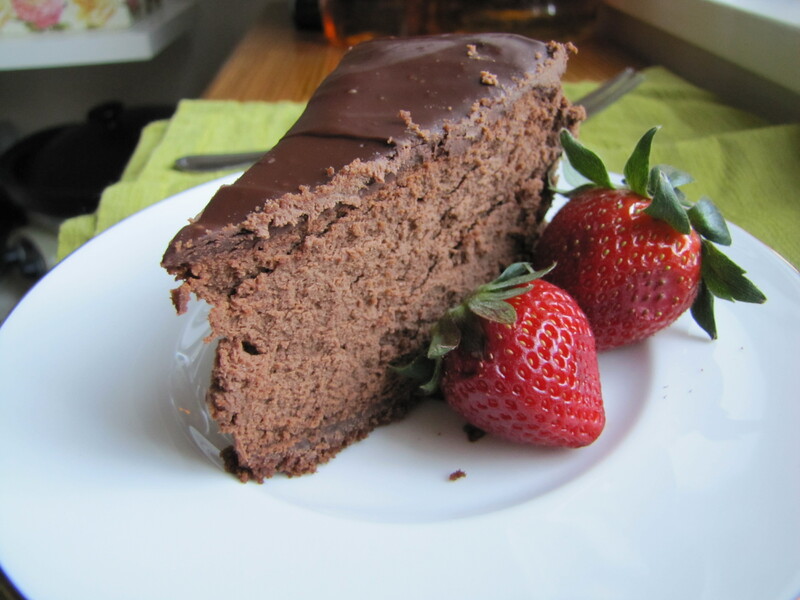 Chocolate Cheesecake with Dark Chocolate Kahlua Ganache – Voila! Ganache is such a great word. Fun to say and even more fun to eat. If this blog wasn’t called Voila! maybe I’d name it ganache. This particular ganache is as wonderful as the intensely rich and sinful chocolate cheesecake that it stands on. Now, some people say “oh this dessert is too rich!” Here’s a fact about me: I like and can handle rich desserts. To adapt a line from Patrick Henry, “give me rich or give me death!” What else are (some) desserts supposed to be? Desserts are meant to be indulgences of the senses! I made this for Valentine’s Day this year so you could wait until next year or do it tomorrow. NOTE: Make a day ahead. 1. Melt the chopped chocolate in a glass bowl placed over a saucepan of simmering water, stirring until smooth. Remove from heat and set aside to cool. 2. Meanwhile, in the bowl of your electric mixer or with a hand mixer beat the cream cheese, on medium low speed, until smooth. Gradually beat in the sugar. 3. Add the melted chocolate and beat until fully incorporated. Add the eggs, one at a time, beating well (about 30 seconds) after each addition. Scrape down the sides of the bowl as needed. Add the vanilla extract and sour cream and beat until thoroughly incorporated. 4. Remove the crust from the refrigerator and pour in the filling. Place the cheesecake pan on a larger baking pan and place in the oven. 5. Bake for about 50 – 55 minutes or until firm yet the center of the cheesecake will still look a little wet and wobbly. Remove from oven and carefully run a knife or spatula around the inside edge of pan to loosen the cheesecake (helps prevent the surface from cracking as it cools). Let cool and then cover with plastic wrap and refrigerate for a few hours or overnight before covering with the ganache. 1. Place the chopped chocolate in a medium glass bowl. Heat the cream and butter in a small saucepan over medium heat. Add kahlua and whisk together. Bring just to a boil. 2. Immediately pour the boiling cream over the chocolate and allow to stand for a few minutes. Stir until smooth. Cool slightly and then pour over cheesecake. 3. With back of a spoon, evenly spread the ganache over the top of the cheesecake. Cover and return to the refrigerator for several hours before serving. Garnish with berries or whipped cream. Next Post Voila! Turns 3! OOOOO Can’t wait to try this. It looks soooo good I can taste it in my mind.